Mike Walker Academy was founded by Mike Walker after many years in the sporting industry, creating a one stop shop for all areas of tennis development. Born in Manchester his family moved to Colwyn Bay in North Wales at the age of nine. Mike’s love of tennis began playing in the local park against a wall. Mike has a passion for all sports but tennis is his true love and through his dedication, hard work and performance has led him to a successful career playing professional tennis. During the five years playing professional tennis Mike played main draw Wimbledon singles, doubles and mixed doubles and was also a member of the Great Britain Davis Cup Team. Mike moved to Hong Kong and became the Coaching Director for Hong Kong Tennis Association and continued to play tennis becoming the Men’s Singles Number 1 and played several times in the Hong Kong Davis Cup. Moving back to England some years later Mike went on to work for the Lawn Tennis Association as the Manager for Performance for the South East of England and LTA Academy Manager, working very closely with Patrice Hagulear. 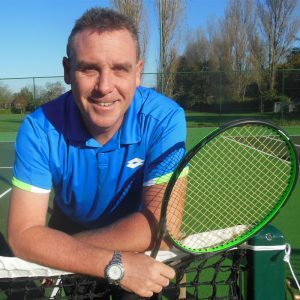 Mike was Head of Win Tennis Academy at Bisham Abbey in Buckinghamshire which produced many ATP, WTA and ITF players, including Kyle Edmund and Johanna Konta. Mike became interested in sport and business and became Chairman of the Institute of Directors for Buckinghamshire and Managing Director of Thomas International Sport and Education. Mike returned to Hong Kong as Director of Player Development and Davis Cup Captain for the HKTA. Mike spent two years in Hong Kong during which time the noticeable successes included coming sixth in the Girls Under 14 World Team Championships, Wining Group 2 of the Federation Cup. Mike also captained the Davis Cup win against Vietnam culminating the first ever medal win at the World University Games. With an entrepreneurial approach Mike has achieved considerable growth and high performance in all areas. Many achievements were attained whilst working alongside influential and committed people at the highest levels in sport, including governing bodies, well known sporting personalities and Government. Mike is dedicated to working with players and coaches alike, to help them achieve their goals.